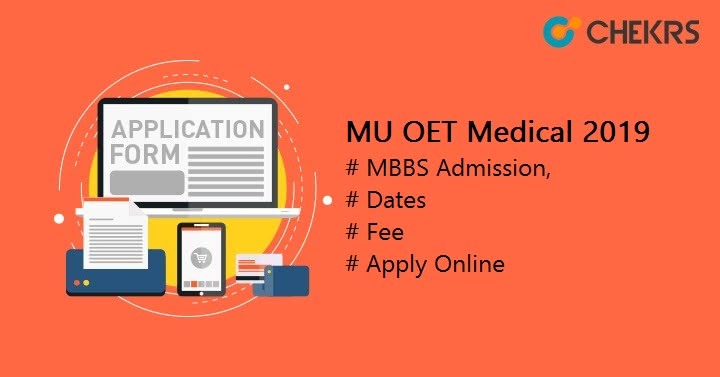 MU OET Medical 2019: Manipal University conducts MU OET every year to provide admission into varies UG and PG courses. In Medical field it is currently providing admission into B.Pharma, Pharma. D, M.Pharma, M.Sc Nursing, and M.Sc Medical programs. Latest Update: MU OET Application Form Filling Last Date and Form Correction Dates Announced!! Check the table below. Latest Update: MU OET Application Form is Available Online!! Fill it before the Last Date. Check the Procedure Below. It may offer admission into MBBS and B.DS courses but it is not confirmed yet. If MBBS added to course list than admission will be provided on the basis of NEET Score. So let’s focus on MU OET Entrance Exam for Medical and medicine field. So in this article, we will talk about MU OET Medical Application Form, Exam dates and other important parts of the entrance exam. The tentative dates for MU OET 2019 are given below, We will update it with the official announcement. MU OET Medical Application Form will be available in the month of November 2018. If admission will be provided for MBBS than NEET score will be considered so candidates have to just appear in the counseling or MU OET Medical Admission Round. For other courses, they have to appear in the exam. Candidates must have valid rank obtained in the National Eligibility Entrance Test (NEET). 4 ½ years plus 1 year of compulsory rotating internship is required. There are no need to not submit the equivalence certificate for CBSE, ISCE, any other Indian Board qualified students. For Admission into Other courses, candidates have to score minimum 50% marks in MU OET. Registration Form will be available online on the official website. Candidates have to fill the application form and then they have to send it to the given postal address. For MBBS and BDS candidates have to fill the MU OET Registration Form or admission form to get the admission. Steps are given below. Probably the Admission form will be available later. The MU OET Application Fee for all courses is Rs. 2000/- which can be paid through the credit card/debit card/internet banking or DD. First of all, Candidates have to visit the official website. Then find the link for Admission 2019. Register yourself and Click on the link and open the MU OET Medical Application Form. Fill the application form there and after filling the application pay the application fee via credit card/debit card/internet banking or DD. Download the Application form through clicking on Print/ Download button. If Offline Fee payment method chosen then pay the fee via DD in favour of Manipal Academy of Higher Education, payable at Manipal, Udupi. After making the payment send the Filled Application form with fee receipt and required documents on the following address. Currently, the Exam Pattern is only available for B.Pharma and Pharma.D. For all other courses, you have to visit the official website. Duration of Exam: 2:30 hours. For B.Pharma and Pharma.D the MU OET Medical Syllabus will contain topics of Physics, Chemistry, Mathematics, and English and General Aptitude. Admission in MBBS and BDS will be done on the basis of NEET Score so candidates have to do preparation for the NEET. MU OET Medical Slot Booking step will be also conducted. In Slot, Booking candidates have to choose a Preferred Exam time and center from the available slots and after that, the Admit Card will be also generated after slot booking. A confirmation message will be also received by the students on the registered phone and email. MU OET Medical Admit card will be generated just after booking the slot. Candidates have to download the Hall ticket and bring it to the exam center. Admit card will be also used at the time of counseling and admission. For courses which don’t have entrance exam have to also book a slot for the counseling round. They have to select Manipal University Counselling Venue and date from the available options. Manipal University will declare the MU OET Result on the official website. The Result will be declared on different dates for different courses. The Result is expected to be released in the last week of May 2019. On the basis of available seats and qualified candidates, separate MU OET 2019 Cut Off Marks List or rank list will be prepared and released on the official website. Candidates will be called for counseling on the basis of their Rank on the rank list. Candidates have to also book a MUOET Counselling slot in which they need to select venue and date. Candidates have to report at the counseling venue on the given date. At the venue, candidates have to bring all the required Documents for the verification. After the Document verification Seat will be allotted to the qualified students on the basis of Rank, Category, Chosen seat and course, Seat availability and reservation. After the MUOET Seat Allotment candidates have to report at the allotted college and there they will get admission.